Playing a central role in both innate and adaptive immunity, CD4+ T cells are a key target for genetic modifications in basic research and immunotherapy. In this article, we describe novel lentiviral vectors (CD4-LV) that have been rendered selective for human or simian CD4+ cells by surface engineering. When applied to PBMCs, CD4-LV transduced CD4+ but not CD4− cells. Notably, also unstimulated T cells were stably genetically modified. Upon systemic or intrasplenic administration into mice reconstituted with human PBMCs or hematopoietic stem cells, reporter gene expression was predominantly detected in lymphoid organs. Evaluation of GFP expression in organ-derived cells and blood by flow cytometry demonstrated exclusive gene transfer into CD4+ human lymphocytes. 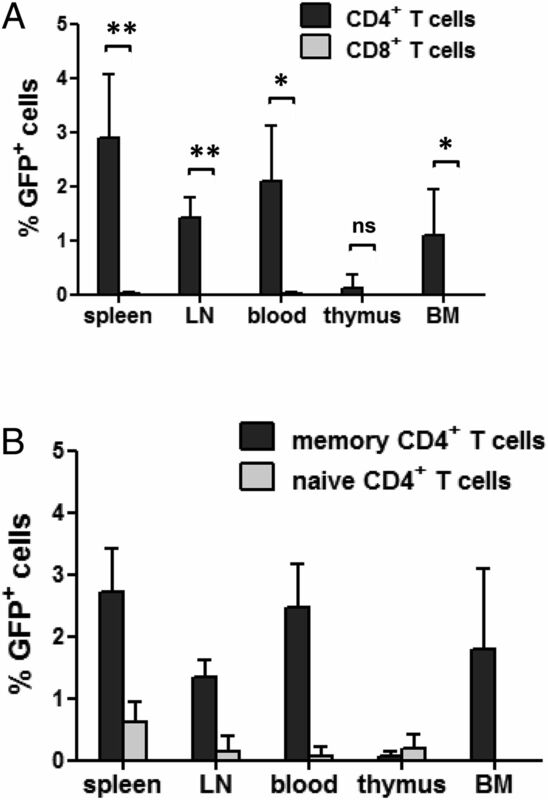 In bone marrow and spleen, memory T cells were preferentially hit. Toward therapeutic applications, we also show that CD4-LV can be used for HIV gene therapy, as well as for tumor therapy, by delivering chimeric Ag receptors. The potential for in vivo delivery of the FOXP3 gene was also demonstrated, making CD4-LV a powerful tool for inducible regulatory T cell generation. In summary, our work demonstrates the exclusive gene transfer into a T cell subset upon systemic vector administration opening an avenue toward novel strategies in immunotherapy. The CD4+ T cells are key players for coordinating immune responses by interacting with different cells including CD8+ T cells, B cells, and dendritic cells. The quantity and function of CD4+ T cells greatly impact the development of numerous diseases, such as HIV infection/AIDS, various types of cancer, autoimmune diseases, and allergy diseases (1, 2). Moreover, recent studies have demonstrated that functional human regulatory T cells (Tregs) can be efficiently and consistently induced by ectopic FOXP3 expression mediated by lentiviral gene transfer in genetic autoimmune disease (3) and rheumatoid arthritis (4). Hence, CD4+ T cells are important target cells not only for understanding fundamental immunology but also for gene therapy and immunotherapy approaches. So far, clinical trials relying on the genetic modification of CD4+ T cells are based on transducing T cells ex vivo with lentiviral vectors (LVs). However, ex vivo gene transfer requires isolation, long-term expansion, and reinfusion of the cells, which may change their properties, reduce their in vivo persistence, and eventually lead to poor clinical response (5–7). Thus, it is highly desirable to develop CD4+ T cell–specific vectors that mediate specific and stable in vivo gene transfer into CD4+ T cells upon local and systemic administration. To achieve this ambitious goal, gene delivery vehicles must fulfill distinct properties, such as attaching to and entering solely CD4+ cells, mediating long-term stable gene expression, allowing high-titer vector production, and being resistant to pre-existing immunity. To date, receptor-targeted LVs appear to be most promising to reach this goal. The system relying on measles virus (MV) glycoproteins has proved to be highly flexible and particularly selective (8). The MV hemagglutinin (H) is fused to a targeting domain that can be a single-chain Ab (scFv) or a designed ankyrin repeat protein (DARPin) (9) recognizing a defined Ag expressed on the surface of the cell type of interest. Different receptor-targeted LVs have been generated being specific for cell types such as CD8+ T cells (10), B cells (11, 12), dendritic cells (13), endothelial cells (14), hematopoietic stem cells (HSCs) (8, 15), neurons (8), and tumor cells (16, 17). Besides the high flexibility for targeting, a unique property of MV pseudotyped LVs is their capacity to efficiently transduce resting lymphocytes, whereas LVs pseudotyped with the vesicular stomatitis virus glycoprotein (VSV-LV) are unable to do so due to lack of receptor expression (11, 18–22). We have recently described a CD8-targeted LV, which is highly selective for CD8+ cells and can transfer tumor Ag-specific TCR genes exclusively into CD8+ cells (23). However, vector yields were too low for systemic injections. In this study, we generated a CD4-targeted LV (CD4-LV) by displaying a CD4-specific DARPin (24) on the modified H protein. CD4-LV was highly specific and effective in genetic modification of human CD4+ T cells, both in vitro in human PBMCs and in vivo in humanized mouse models upon systemic administration. Moreover, we demonstrate potential applications of CD4-LV in immunotherapy and HIV treatment. HEK293T, Raji, PM-1, and Molt4.8 cells were cultivated as described previously (12, 23, 25). A301 and MDA-MB-453 cells were grown in RPMI 1640 medium supplemented with 10% FBS and 2 mM l-glutamine. Human PBMCs were isolated and cultivated as described previously (23). Rhesus PBMCs were isolated from 30 ml fresh blood by density centrifugation (1028 × g for 30 min) using 15 ml 95% Histopaque-1077 (Sigma-Aldrich) in PBS. PBMCs were collected, the remaining erythrocytes were lysed in 0.86% ammonium chloride, and the PBMCs were finally cultivated in T cell culture medium (23). The coding sequences of CD4-specific DARPins (24) were PCR amplified and cloned into the pCG-Hmut (23) backbone via SfiI and NotI as described before (17). HIV-1–derived transfer vector plasmids encoding GFP (pSEW) (12), membrane-associated peptide C46 (maC46) and GFP (M589) (25), luciferase (luc) and GFP (pS-luc-GFP-W) (14), or ErbB2-specific chimeric Ag receptor (pS-ErbB2-CAR-W) (26) have been described previously. For the generation of plasmids encoding FOXP3 and ∆NGFR, the reading frames of human FOXP3 (Sino Biological) and ∆NGFR (kindly provided by Dr. Ute Modlich, Paul-Ehrlich-Institut) were PCR amplified and inserted into pS-luc-GFP-W by sticky-end-ligation using BamHI/SbfI and RsrII/NdeI restriction sites resulting in plasmid pS-FOXP3-∆NGFR-W.
To produce CD4-LV, we used 0.9 μg pCG-Hmut-CD4-DARPin, 4.7 μg pCG-FcΔ30 (12), 14.4 μg HIV-1 packaging plasmid pCMVΔR8.9 (10), and 15.1 μg of the transfer vector plasmid for transfection with polyethyleneimine. Availability of the plasmids may be restricted by Material Transfer Agreements. Wild-type MV glycoprotein pseudotyped LV and VSV-LV were produced as described previously (19). For SIV-derived vector generation, 12.9 μg SIVmac251 packaging plasmid SIV10+ (27) and 15.1 μg SIVmac251 transfer vector plasmid GAE-sffv-gfp-wpre (27) were combined with pCG-FcΔ30 and pCG-Hmut-CD4-DARPin as described earlier. The vector particles were concentrated and purified by ultracentrifugation through a 20% (w/v) sucrose cushion (100,000 × g for 3 h at 4°C). Titers of the vector stocks were determined on A301 or Molt4.8 cells. Particle numbers were determined by NANOSIGHT-NS500 (Nanosight). Without specific identification, transduction of primary cells was performed in the presence of 4 μg/ml protamine sulfate (Sigma-Aldrich). For transduction of PBMCs, 2 d before incubation with vector, human and rhesus cells were stimulated with anti-CD3 (1 μg/ml)/anti-CD28 (1 μg/ml)/IL-2 (100 IU/ml) and PHA (2 μg/ml)/IL-2 (100 IU/ml), respectively. For transduction of unstimulated and stimulated human PBMCs in Fig. 2, freshly isolated cells were incubated with vector particles by centrifugation for 1.5 h at 800 × g, 32°C. All animal experiments were performed in accordance with the regulations of the German animal protection law and the respective European Union guidelines. Immunodeficient NOD-scid-IL2Rγnull (NSG) mice were repopulated with either human PBMCs or human HSCs. For reporter gene delivery in PBMC-humanized mice, we i.v. injected 6- to 8-wk-old NSG mice with unstimulated or stimulated PBMCs. When 10–20% human CD45+ cells were detected in the peripheral blood, 200 μl CD4-LV or PBS was administered the next day. For depletion of CD4+ cells from human PBMCs, CD4 MicroBeads (Miltenyi Biotec) were applied according to the manufacturer’s instructions. After humanization, mice were closely monitored for signs of graft-versus-host disease and sacrificed if graft-versus-host disease was diagnosed. For in vivo FOXP3 gene delivery, 7- to 9-wk-old NSG mice were i.p. injected with 1.5 × 107 unstimulated PBMCs. Two days later, 200 μl CD4-LV was administrated by i.p. injection. For HSC engraftment, 5- to 6-wk-old NSG mice were irradiated at 150 cGy (Co-60 whole-body irradiation device; Buchler) and the next day i.v. injected with 1 × 106 peripheral blood–derived CD34+ HSCs (CD34 MicroBeads; Miltenyi Biotec) obtained from adult healthy donors with informed consent. When at least 10% human CD45+ cells was detected in peripheral blood, human T cells were stimulated by i.v. injection of 10 μg OKT3 followed by vector application 7 d later. Alternatively, 2- to 3-d-old NSG mice were intrahepatically injected with 2 × 105 prestimulated (20 ng/ml thrombopoietin and 100 ng/ml stem cell factor) cord blood–derived CD34+ cells after 1 Gy irradiation. Reconstituted mice received 200 ng human IL-7 twice in a 3-d interval 4 d before intrasplenic injection of 100 μl CD4-LV. In vivo images were taken using an IVIS Spectrum device (Caliper Life Science) and analyzed using the Living Image 4 software (PerkinElmer) as described previously (14). FACS analysis was performed using an LSRII or FACSCanto II flow cytometer (Becton Dickinson), and data were analyzed with the FCS Express 4 (De Novo Software) or FlowJo (Tree Star) software. Cell-surface expression of H protein variants was assessed by anti–His-tag Ab (Miltenyi Biotec). To identify CD4+ cells in human or rhesus macaque PBMCs, we used the anti-human CD4-PE Ab (BD Pharmingen). For detection of CAR specific for the tumor-associated Ag ErbB2 (ErbB2-CAR) expression, transduced cells were stained with rhErbB2/Her2 Fc Chimera (R&D Systems) and anti-human IgG-PE (Fcγ Fragment Specific) Ab (Jackson Immunoresearch). For detection of FOXP3 expression, the cells were stained with FOXP3-PE and CD25-allophycocyanin-Cy7 Abs (BD Pharmingen) following the instructions of the FOXP3 Fix/Perm Buffer Set Kit (Biolegend). For flow cytometry of hematopoietic tissues from humanized mice, prepared single-cell suspensions were preincubated with anti-mouse CD16/CD32 Ab (eBioscience) before staining with anti-human Ab cocktails. To identify human leukocytes or T cells, we used anti-human CD45-allophycocyanin, CD3-PE, CD4-allophycocyanin-Cy7, or CD8-Pacific Blue Abs from BD Pharmingen. To detect ∆NGFR transgene expression, we used an LNGFR-allophycocyanin (Miltenyi Biotec) Ab. 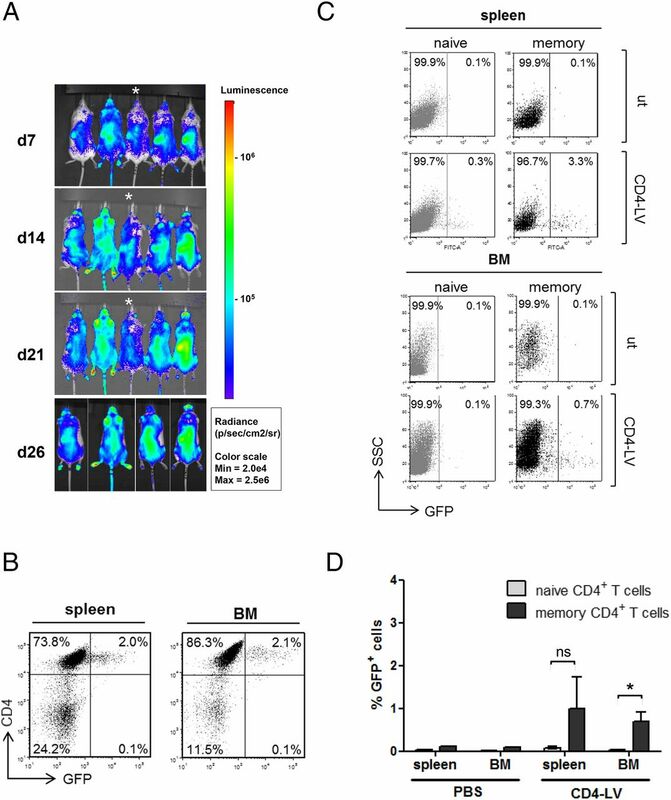 Naive and memory T cells were distinguished by anti-human CD45RA-allophycocyanin and CD45RO-PE Abs from eBioscience. Corresponding isotype controls were used for all experiments. For quantification of GFP+ cells, at least 100,000 (blood) or 1 million events (organs) were acquired. Western blot analysis of concentrated vector particles was performed as described previously (16). PM-1 cells were incubated with different dilutions of CD4-LV-maC46-GFP or CD4-LV-GFP, and plates were then centrifuged for 1 h at 31°C at 2000 rpm. Six days later, 1 × 105 low-level transduced PM-1 cells were infected with HIVD117/II, a highly cytopathic dual-tropic primary isolate generated at the Georg-Speyer-Haus (H. von Briesen, unpublished data) in triplicate samples by adding 50 μl virus supernatant (∼150 infectious units) to each well. Postinfection, cells were regularly monitored for GFP expression by flow cytometry at the indicated time points. Cytotoxic activity of CAR-modified PBMCs was analyzed in FACS-based assays as described previously (23). In brief, 1 × 105 ErbB2+ MDA-MB-453 cells were labeled with calcein violet acetoxymethyl (AM) (Life Technologies, Darmstadt, Germany) and coincubated with defined numbers of effector and target cells. To compensate for variation of transduction efficiency mediated by different vectors, we counted only the ErbB2-CAR+ cells as effectors. Four hours after cocultivation, dead tumor cells were analyzed by flow cytometry via propidium iodide staining (Sigma-Aldrich). The percentage of specific tumor cell lysis was calculated using the following equation: (PI+ calcein violet AM+ cells/total number of calcein violet AM+ cells) × 100. Data were analyzed using the unpaired Student t test. The p values are given in the figure legends. GraphPad Prism 5 was used for statistical analysis. For the generation of CD4-LV, whereas the fusion protein (F protein) was engineered as previously described (12), the human CD4-specific DARPin 29.2 (D29.2) coding sequence (24) was fused to that of Hmut∆18 (Fig. 1A). Upon transfection, the encoded H-αCD4D29.2 F protein was expressed at high levels on the surface of HEK293T packaging cells (Fig. 1B), which allowed its efficient incorporation into LV particles together with F protein (Fig. 1C). After expressing H-αCD4D29.2 in LV packaging cells, concentrated CD4-LV with a titer of 2.0 ± 0.5 × 108 (n = 11) transducing units (t.u. )/ml was generated. Characterization of CD4-LV. (A) Schematic representation of H-αCD4 and FΔ30. Both the H and F proteins are truncated at their cytoplasmic tails (CT) to allow efficient incorporation into the lentiviral envelope. To ablate the natural receptor recognition, four point mutations are present in the Hmut∆18 marked by asterisks. The CD4-DARPin is fused to the C terminus of H and a histidine tag (6 His) is present at the DARPin’s C terminus. (B) HEK293T cells were transfected with plasmid pCG-Hmut-CD4-DARPin and surface expression of H-αCD4 was analyzed by flow cytometry via staining with a PE-conjugated anti-His Ab (black line). The empty expression plasmid pCG-1 was used as a negative control (gray area). (C) To analyze the incorporation of H-αCD4 and F protein into LV particles, we analyzed concentrated CD4-LV (produced with a 1:5 ratio of H-αCD4 to F encoding plasmids) by immunoblot analysis using Abs to H, F, and p24. Wild-type DARPin-deficient H and F pseudotyped wild-type MV glycoprotein pseudotyped LV (MVwt-LV) particles (produced with a 1:3 ratio of Hwt to F encoding plasmids) were used as control. (D) CD4-LV (MOI = 1) was used to transduce CD4+ Molt4.8 T cell and CD4− Raji B cell lines, respectively, and the percentages of GFP+ cells were determined by FACS. TM, transmembrane domain. CD4-LV transduced CD4+ Molt4.8 cells but left CD4− Raji cells untransduced (ut; Fig. 1D). Selectivity was then assessed on human PBMCs. Whereas VSV-LV transduced both CD4+ and CD4− T cells, CD4-LV exclusively transduced CD4+ T cells (∼55%; Fig. 2A). Thus, CD4-LV was demonstrated to be highly specific and efficient for transduction of its target cell population. Transduction of primary CD4+ T cells with GFP. (A) Stimulated human PBMCs were transduced with CD4-LV or VSV-LV at an MOI of 2, respectively. Transduction efficiency was assessed 4 d after transduction. (B) PBMCs from a rhesus macaque were stimulated with PHA and IL-2 for 2 d followed by transduction with CD4-SIV. The same amounts (physical particles) of SIV vector pseudotyped with VSV-G (VSV-SIV) were used as positive control. Transduction efficiency was assessed 4 d after transduction. (C) Freshly isolated PBMCs were left ut or transduced with CD4-LV (MOI = 2) to assess whether CD4-LV can transduce resting T cells. Three days later, half of the transduced cells were analyzed by FACS to determine the percentage of GFP+ cells in the CD4-gated cells. To confirm stable GFP expression, we further cultivated the other half of the transduced cells in the presence of anti-CD3/anti-CD28/IL-2 stimulus, after a washing step, for an additional 3 d. The percentages of CD4+/GFP+ cells in the CD4-gated cells were determined by FACS. Meanwhile, stimulated PBMCs transduced with CD4-LV at the same MOI were used as a positive control. Representative FACS data for one of three donors are shown. The average transduction efficiency rate was 7.7 ± 0.9% (n = 3). (D) Unstimulated or stimulated PBMCs were transduced with CD4-LV at an MOI of 2 or remained ut. At the indicated days after transduction, CD4 cell-surface expression was determined by staining the cells with an allophycocyanin-conjugated anti-CD4 Ab. Nonhuman primate models are critical to precisely predict the effectiveness and safety of gene therapy products. To this end, we generated a CD4-targeted vector specific for rhesus macaque CD4+ T cells. DARPin 57.2 (D57.2) (24, 28), which detects both human and rhesus macaque CD4, was used as a targeting domain and fused to Hmut∆18 (H-αCD4D57.2). Because SIV vectors perform better than HIV vectors in simian cells, CD4-SIV was produced by pseudotyping SIVmac251-derived LV with H-αCD4D57.2 and F protein. In rhesus macaque PBMCs, CD4-SIV delivered GFP to CD4+ T cells, but not to CD4− T cells residing in the same culture (Fig. 2B). Notably, when the same amounts of vector particles were applied, CD4-SIV transduced T cells more efficiently than VSV-SIV (Fig. 2B). We next investigated the ability of CD4-LV to transduce freshly isolated unstimulated T cells. Notably, CD4-LV was also able to transduce unstimulated CD4+ T cells (8.1% GFP+). To exclude pseudotransduction, we continued to culture the transduced cells in the presence of anti-CD3/anti-CD28/IL-2 stimulus. FACS analysis 6 d after transduction confirmed that these cells were indeed stably transduced (7.9% GFP+; Fig. 2C). As expected, CD4-LV more efficiently transduced stimulated T cells from the same donor, with about a 5-fold increase in transduction rate (Fig. 2C). Interestingly, CD4-LV induced a temporary downregulation of CD4 expression at the T cell surface, especially in unstimulated PBMCs. The reduction in CD4 was most pronounced 3 d after incubation with CD4-LV, followed by a recovery to the basal level by day 10 (Fig. 2D). We next assessed the in vivo targeting potential of CD4-LV after systemic administration in a humanized mouse model. NSG mice transplanted with stimulated or unstimulated PBMCs were i.v. injected with CD4-LV carrying a bicistronic GFP-luciferase reporter gene as described in Fig. 3A. Six to 10 d after vector injection, luc expression was detected in all groups of PBMC-engrafted mice that had received CD4-LV and correlated positively with the amounts of vector particles injected (Fig. 3B). When the same amounts of vector were applied, mice transplanted with stimulated PBMCs (Group-F) exhibited stronger luc activities than mice engrafted with unstimulated PBMCs (Group-E). Highest luc activities were present in spleen, thymus, and lymph nodes (LN) (Supplemental Fig. 1). In control groups, where PBMC-transplanted mice received PBS (Group-A) or NSG mice were injected with CD4-LV in the absence of PBMCs (Group-B), there were no or negligible luc activities present as determined by whole-body imaging (Fig. 3B) or in isolated lymphoid organs (Supplemental Fig. 1). Mice transplanted with CD4+ cell–depleted PBMCs also expressed dramatically decreased luc signal compared with the PBMC-engrafted mice having received the same vector dose (Fig. 3B, Group-C versus Group-F), further demonstrating the selectivity of CD4-LV. The residual luc activity was very likely due to some remaining CD4+ T cells in the engraftment. Next, we determined GFP expression present in cells of spleen and blood by flow cytometry. Notably, GFP activity was only detected in human cells, but not in mouse cells (Supplemental Fig. 2A). Moreover, neither in spleen nor in blood were any GFP+ cells present in the CD3+/CD4− cell fractions (Fig. 3C). In contrast, GFP+ cells were readily detected in the CD3+/CD4+ fractions of mice having received stimulated or unstimulated PBMCs, respectively (Fig. 3C). Transduction rates reached up to 2% of the human CD4+ cells for unstimulated and up to 16% for stimulated PBMCs (Fig. 3D). In vivo transduction of CD4+ T cells in PBMC-engrafted mice. (A) Schematic diagram of the experimental setup and the transfer vector construct used for in vivo gene delivery. On day 0, either 5 × 107 unstimulated PBMCs or 1.5 × 107 PBMCs stimulated with anti-CD3/28 and IL-2 (for 3 d) were i.v. injected into NSG mice. Four days after PBMC engraftment, when 10–20% human CD45+ cells were present in peripheral blood, CD4-LV transferring luciferase (luc) and GFP were administered i.v. The two reporter genes were fused via a T2A (2A peptide from Thosea asigna virus) linker and put under control of the spleen focus-forming virus (SFFV) promoter. Six to 10 d after vector injection, luc activities were determined by in vivo imaging (B) and GFP expression was quantified by FACS (C and D). (B) Representative images for two of five or six individual mice from each group on days 6–10 after vector administration. Group-A: mice received PBMCs and PBS; Group-B: nonhumanized mice received 5 × 106 t.u. CD4-LV; Group-C: mice received CD4-depleted PBMCs and 8 × 107 t.u. CD4-LV; Group-D: mice received unstimulated PBMCs and 5 × 106 t.u. CD4-LV; Group-E: mice received unstimulated PBMCs and 8 × 107 t.u. CD4-LV; Group-F: mice received stimulated PBMCs and 8 × 107 t.u. CD4-LV. Luc signal intensity is expressed as photons/s/cm2/steradian (p/sec/cm2/sr). (C and D) Six to ten days after vector administration, cells isolated from blood and spleen of PBS- or CD4-LV–injected mice were stained with anti-human CD3, CD4, and CD45 Abs. The percentages of GFP+ cells in human CD3+/CD4+ or CD3+/CD4− cells were determined by flow cytometry. (C) Representative data from one of five or six independent experiments are shown. (D) Percentages of GFP+ cells within human CD3+/CD4+ cells. Each dot represents a mouse. Results are expressed as mean ± SEM. *p < 0.05, **p < 0.01, ***p < 0.001. Next, we assessed CD4-LV in mice engrafted with human CD34+ HSCs from healthy donors. In this mouse model, human T cells developing from engrafted HSCs are tolerated by the mouse host, thus allowing long-term monitoring of transgene expression in vivo. Once 5–15% of human CD4+ T cells and 5–35% of human CD19+ B cells were detected in the peripheral blood (data not shown), OKT3 was administered to stimulate the human T cells, rendering them more permissive for transduction. Gene transfer mediated by systemically injected CD4-LV was then monitored by luc imaging over several weeks. Luc activities became detectable 7 d after CD4-LV injection and the signal increased within the observation period, demonstrating that the transgene expression was stable (Fig. 4A). On day 26, mice were sacrificed and lymph nodes (LN), spleen, and bone marrow (BM) were isolated to determine the transgene expression (Supplemental Fig. 1). Around 2% of the human CD4+ cells in spleen and BM were transduced after a single i.v. injection of CD4-LV (Fig. 4B), but no other human or any mouse cells (Supplemental Fig. 2B). The majority was memory T cells, whereas naive T cells were rarely transduced (Fig. 4C, 4D). In vivo targeting of CD4+ T cells in HSC-engrafted mice. Purified CD34+ cells were injected into 5- to 6-wk-old NSG mice subjected to 150 cGy irradiation. After establishing human cell engraftment by detecting >10% of human CD45+ cells in blood, 1.5 × 107 t.u. CD4-LV transferring the luciferase-GFP reporter gene were injected i.v. (A) In vivo luminescence imaging monitored on the indicated days after vector injection. One mouse (labeled by asterisk) was sacrificed before the end of the observation period due to splenic hyperplasia. Twenty-six days after vector injection, spleen and BM were isolated to determine the percentages of transduced cells (B) and their naive or memory phenotypes (C and D). (B) Representative FACS data for one of four individual mice showing the percentage of GFP+/CD4+ cells in the CD45+/CD3+ gate. (C) Percentage of GFP+ cells in the human memory (CD45RO+) and naive (CD45RA+) T cell subsets. (D) Average transduction rates of CD4+ T cells. Results are expressed as mean ± SEM. n = 4. *p < 0.05. ns, not significant. Although OKT3 is potent in activating T cells and allowing efficient LV-mediated gene transfer, its immunogenic and mitogenic activities hamper clinical applications (29). Instead, IL-7 is broadly applied in the clinic, because it has been demonstrated to be safe to induce stimulation and expansion of systemically administered T cells. Thus, we next injected CD4-LV intrasplenically into human immune system mice that had been pretreated with IL-7. As summarized in Fig. 5A, CD4-LV exclusively transduced CD4+ T cells, which were not only detectable in spleen and BM, but also in blood and LN. A few transduced thymocytes were also detected within the CD4+ gate but none in the CD8+ gate. Similar as observed in OKT3-treated mice, CD4-LV transduced memory T cells preferably over naive T cells (Fig. 5B). In vivo targeting of CD4+ T cells upon intrasplenic injection of CD4-LV into HSC-engrafted mice. Prestimulated cord blood–derived CD34+ cells were injected into 2-to 3-d-old newborn NSG mice subjected to 1 Gy irradiation. After verification of human cell engraftment by detecting >30% of human CD45+ cells in the blood, mice were treated with IL-7 4 d before 1 × 107 t.u. CD4-LV transferring the luc-GFP reporter gene were injected intrasplenically. Three weeks after vector injection, the indicated hematopoietic tissues were harvested and cells were prepared for FACS analysis. (A) In vivo transduction rates for human CD4+ or CD8+ T cells. Results are expressed as mean ± SEM. n = 4. (B) The phenotypes of the transduced cells were analyzed as described in Fig. 4C. Results are expressed as mean ± SEM. n = 2 or 4. *p < 0.05, **p < 0.01. ns, not significant. Because CD4+ T cells play an important role during viral infection and cancer development, we next explored potential therapeutic applications of CD4-LV. To assess the potential for inhibiting HIV-1 infection, we transferred a viral entry inhibitor, the membrane-anchored C46 peptide, together with GFP (maC46-GFP) (25) into human T cells by CD4-LV at different multiplicities of infection (MOIs) after serial dilutions of the vector. Cells were analyzed by FACS, and those wells exhibiting a low transduction efficiency (1.8% for CD4-LV-maC46-GFP and 3% for CD4-LV-GFP) were selected for HIVD117/II infection or left uninfected as controls. In the absence of HIVD117/II infection or when cells were transduced with GFP alone, the percentages of GFP+ cells remained unchanged (Fig. 6A). In contrast, T cells transduced with CD4-LV-maC46-GFP became highly enriched in the presence of HIVD117/II. This demonstrates that CD4-LV can be used to protect CD4+ T cells from infection with HIV-1. Therapeutic application of CD4-LV. (A) maC46 transduced T cells are protected from HIV infection. PM-1 cells, a CD4+ T cell clone with unique susceptibility to a wide range of HIV-1 strains, were transduced with CD4-LV-maC46-GFP or CD4-LV-GFP. After transduction, CD4-LV-maC46-GFP transduced cells (1.8% GFP+ cells) or CD4-LV-GFP transduced control cells (3.0% GFP+ cells) were challenged with or without HIVD117/II. Cells were infected in triplicate samples. At the indicated time points, percentages of GFP+ cells in the cultures were monitored. Results are expressed as mean ± SEM. n = 3. (B) Tumor cell lysis by T cells transduced with CD4-LV-ErbB2-CAR. After prestimulation, activated PBMCs were transduced with CD4-LV-ErbB2-CAR or VSV-LV-ErbB2-CAR. Cells left ut or transduced with VSV-LV-GFP were included as negative controls. Identical numbers of ErbB2-CAR+ T cells were applied as effector cells and used to normalize E:T ratios. Four hours after cocultivation, lysis of MDA-MB-453 target tumor cells was determined by FACS. Results are expressed as mean ± SEM. n = 3. (C) Production of IFN-γ and TNF-α during coculture of the indicated transduced T cells with tumor cells at an E:T ratio of 6:1. Cytokine production was measured by multiplex assay. *p < 0.05. ns, not significant. More and more evidence emphasizes the role of CD4+ T cells in antitumor responses, including a direct cytotoxic activity against tumor cells (6, 7). To explore the potential of CD4-LV for cancer immunotherapy, we investigated whether an ErbB2-CAR (26) can be functionally delivered into CD4+ cells. The CAR gene was delivered into almost 90% of the CD4+ cells upon incubation of PBMCs with CD4-LV. In contrast, VSV-LV delivered the ErbB2-CAR into both CD4+ and CD4− (majority of them being CD8+) cells (Supplemental Fig. 3). CD4-LV-ErbB2-CAR transduced PBMCs lysed ErbB2+ tumor cells, whereas ut or VSV-LV-GFP transduced PBMCs did not (Fig. 6B). As expected, VSV-LV-ErbB2-CAR transduced cells lysed more target tumors cells (Fig. 6B), because in this group, the ErbB2-CAR+ effectors included both CD4+ and CD8+ T cells. Besides, upon cocultivation with ErbB2+ target cells, CD4-LV transduced cells secreted high amounts of the Th1-associated cytokines IFN-γ and TNF-α (Fig. 6C). Thus, CD4-LV–mediated CAR expression in CD4+ T cells renders them functionally active and capable of lysing target tumor cells. Eventually we analyzed whether CD4-LV allowed stable gene delivery of therapeutic genes in vivo. In this study, the human FOXP3 gene, previously demonstrated to be potent in generating suppressive inducible Tregs (4, 30), was transferred by CD4-LV. In T cell lines, CD4-LV mediated efficient expression of FOXP3 as compared with ut A301 cells (Fig. 7A). In primary human CD4+ T cells, overexpression of FOXP3 was clearly demonstrated (Fig. 7B), although ut cells contained substantial levels of endogenous FOXP3. To better distinguish between endogenous and ectopically expressed FOXP3, we transcriptionally coupled ∆NGFR to FOXP3 via a T2A linker allowing detection of transduced cells by cell-surface staining. The resulting CD4-LV-FOXP3-∆NGFR vector was injected in PBMC-engrafted mice, and stable transgene expression could be detected upon 2 mo postinjection (Fig. 7C). In vitro and in vivo delivery of FOXP3 genes into human CD4+ T cells. (A) Four days after incubating A301 cells with CD4-LV-FOXP3 or leaving them ut, FOXP3 transgene expression was determined by intracellular FACS staining. One representative data set out of three experiments is shown. (B) Human primary CD4+ cells were stimulated with 1 μg/ml soluble OKT3 and irradiated autologous APCs for 24 h followed by transduction with CD4-LV-FOXP3 or were left ut. Five days after transduction, FOXP3 transgene expression was measured by intracellular FACS staining. One representative data set out of three independent experiments shows the percentage of FOXP3+ cells in the CD4+/CD25high gate. (C) NSG mice were i.p. injected with CD4-LVs transferring FOXP3-∆NGFR or blue fluorescent protein (BFP) 2 d after engraftment, respectively. Two months after vector injection, blood samples were collected and ∆NGFR (top panel) or BFP (bottom panel) expression was quantified by FACS in hCD45-gated cells. One representative data set out of three individual mice from each group is shown. This study demonstrates for the first time, to our knowledge, highly selective and stable gene delivery into human CD4+ T lymphocytes upon in vivo administration of LVs. Genetic modification of T cells directly in vivo is especially challenging because T cells are widely distributed in the organism, being present not only in blood but also in various organs. We hypothesized that this goal can only be reached with surface-modified vectors that are selective for T cells at the level of cell entry. In this study, we engineered LV particles such that they used the CD4 molecule as a cell-surface receptor for cellular uptake. Key to achieve in vivo gene delivery was the yield and titer of CD4-LV batches (5.7 × 104 t.u./cm2 culture dish), which is up to 40-fold higher than that of other lymphocyte-targeted LVs that display scFv as targeting domain (CD8-LV, CD20-LV, or CD19-LV) (11, 12, 23). Although we cannot exclude that the enhanced transduction rate is due to the specific properties of the CD4 receptor, the use of a DARPin as targeting domain is the more likely explanation. DARPins are superior to scFv in terms of their physical stability and often also exhibit higher affinities for their target protein (31). Accordingly, previous studies using DARPins to retarget LVs (17) or oncolytic MVs (32) demonstrated their superiority over scFv. Yet, titers of CD4-LV are still, on average, ∼10-fold lower than those of VSV-LV. This is due to the exceptional high stability of the VSV envelope protein, its unique vesiculating properties, and its high resistance to ultracentrifugation (33). It was remarkable that CD4-LV also transduced unstimulated primary CD4+ T cells. For a long time, resting lymphocytes have been resistant to LVs and required mitotic activation to become permissive (11, 34). LVs pseudotyped with nontargeted MV glycoproteins, however, mediate gene transfer into resting T cells without inducing cell activation (20, 21). Because CD4-LV is modified in a manner abolishing MV’s natural receptor recognition, its entry into resting T cells must have occurred through a different mechanism. We and others found that in the case of lymphocytes the interaction between the displayed targeting domain and the targeted cell receptor induces activating stimuli, thus rendering resting lymphocytes susceptible for LV transduction (11, 35). Because CD4 is linked to T cell activation pathways (36), and we observed CD4 internalization upon incubation with CD4-LV, it is indeed likely that CD4-LV triggers cell signaling. However, the overall gene transfer into resting T cells was relatively low, possibly because of the presence of SAMHD1, a key factor that can mediate resistance to HIV-1 infection (37). This restriction can be alleviated through codelivery of the accessory lentiviral protein X (Vpx) with LV vectors (38). Hence, it appears promising to combine CD4-LV with Vpx to possibly improve the transduction of resting T cells. Also in vivo, the activation status of T cells influenced transduction, because higher luc activities, as well as more transduction events, were observed in stimulated than in unstimulated PBMC-engrafted mice. The in vivo distribution of CD4-LV is likely determined by CD4 receptor densities and blood circulation kinetics. We know from previous work (14, 17) that transduction efficiency positively correlates with the cell-surface density of the targeted receptor. This holds true also for CD4-LV, because the transduced LN-, spleen-, and blood-derived CD4+ T cells express high CD4 densities, whereas thymus-derived CD4+ cells that are lower in CD4 densities (Fig. 5A, Supplemental Fig. 4A) remained ut. Notably, unlike what was observed in vitro, we had no evidence that CD4-LV injection caused a temporary CD4 internalization in vivo. The dose of CD4-LV particles per cell was much higher in the in vitro studies, which likely makes the difference in this study. Moreover, CD4-LV preferably transduced memory T cells. These are known to express higher levels of CD4 than naive T cells (Supplemental Fig. 4C) and to reach a higher activation level upon IL-7 stimulation (35). However, we did not observe a correlation between the amounts of resident CD4+ T cells present in a particular organ and the in vivo gene delivery rate (Fig. 5B, Supplemental Fig. 4B). This suggests that the receptor density is more relevant in determining in vivo gene transfer than the local target cell concentration. Previous data from our laboratory demonstrated that in vivo transduction and biodistribution of a vector targeted to an endothelial cell marker was dependent on the velocity of blood flow (14). This may explain the gene transfer observed in BM-derived CD4+ cells with CD4-LV. The low flow rates in the capillaries and venules of the BM may enhance the likelihood for CD4-LV to attach to CD4, thus compensating for a lower CD4 density. Selective gene expression in CD4+ cells has previously been described by others using transcriptionally targeted LVs equipped with CD4-specific promoter and enhancer sequences (39), LVs pseudotyped with engineered Sindbis virus envelope proteins (40), or CXCR4-tropic HIV-1 envelope proteins (38, 41). Although these vector types were selective in vitro on cell lines or primary T cells, transduction efficiencies were moderate and in vivo gene delivery was not investigated. Direct in vivo gene delivery selectively into CD4+ cells was reported for a γ-retroviral vector pseudotyped with HIV-1–derived glycoproteins (42). In this study, however, detectable gene delivery was observed only for CD4+ lymphocytes present in the abdominal cavity upon i.p. injection at rates at least 10-fold below what we report in this article for systemically administered vectors. Given that CD4+ T cells are important for both innate and adaptive immunity, selective in vivo delivery of therapeutic genes into CD4+ T cells has great potential for clinical applications. In this study, we demonstrated the potential of CD4-LV for the treatment of HIV infections by delivering the HIV inhibitor gene maC46. Only maC46-transduced cells, but not GFP-transduced cells, prevented HIV infection, clearly suggesting that the protection is due to the maC46 transgene expression but not due to the temporary CD4 internalization that can be induced by CD4-LV in vitro. Besides applications in HIV gene therapy, the conversion of tumor-targeted T cells directly in vivo can now be considered. In fact, such a strategy would transfer a currently individualized medicinal product (ex vivo transduced autologous T cells) into a universally applicable drug. For translation into humans, however, a number of hurdles may have to be overcome. Among these is pre-existing MV-specific immunity caused by vaccination or natural infection. Recently, we and others demonstrated that the mutations introduced into MV H together with the displayed targeting domain (43), as well as mutations in the Noose and NE epitopes of H (44), can reduce the activity of neutralizing Abs against MV pseudotyped LVs in vivo. Likewise, the use of envelope proteins from nonpathogenic viruses is an option (45). Another challenge will be the required vector dose. Besides further improvements in vector production, yield, and titer, local vector application at the tumor site or into secondary lymphoid tissues can be an option because this will require a lower vector dose than systemic injections. Direct in vivo genetic manipulation may be especially beneficial for CD4+ T cells because these are known to expand less well in vitro than CD8+ T cells, and culture conditions can significantly affect their characteristics (7, 46). Although CD8+ T cells are traditionally considered the predominant component for the elimination of tumors, increasing evidence underscores the importance of using CD4+ T cells as effectors to improve current cancer immunotherapies (7). Indeed, upon CD4-LV transduction, ErbB2-CAR–expressing CD4+ T cells could lyse ErbB2+ tumor cells and produce high amounts of Th1 cytokines even in a short-term killing assay. Our data are consistent with previous studies demonstrating that CAR-engineered CD4+ T cells are capable of direct cytotoxicity and can drive specific cytolysis of target tumor cells (47–49). Beyond cancer, consistent gene transfer of FOXP3 into CD4+ cells is potent in inducing functional Tregs, which may be of relevance for novel therapeutic strategies in autoimmune and inflammatory diseases (3, 4, 50). In line with this idea, we demonstrated the feasibility of achieving continuous ectopic FOXP3 expression in CD4+ cells upon in vivo gene delivery by CD4-LV. Future experiments will reveal whether such in vivo transduced FOXP3+CD4+ T cells have the suppressive efficacy required for successful therapeutic applications. C.J.B. is listed as inventor on patent applications for receptor-targeted lentiviral vectors that have been outlicensed. All other authors have no financial conflicts of interest. We thank Florianne Fusil (Université de Lyon-1, École Normale Supérieure de Lyon) for intrasplenic injections and Gundula Braun (Paul-Ehrlich-Institut) for vector production. This work was supported by CI3 Cluster Grant 031A024C funded by the German Federal Ministry for Education and Research and Bundesministerium für Gesundheit (Grant 2510-790 FSB-705) (to C.J.B.) as well as by the LOEWE Center for Cell and Gene Therapy Frankfurt funded by Hessisches Ministerium für Wissenschaft und Kunst [Grant III L 4-518/17.004 (2010) to C.J.B. and Q.Z.].
. 2012. Pathogenic features of CD4+CD28- T cells in immune disorders. Trends Mol. Med. 18: 446–453.
. 2013. CD4 T-cell immunotherapy for chronic viral infections and cancer. Immunotherapy 5: 975–987.
. 2013. CD4⁺ T cells from IPEX patients convert into functional and stable regulatory T cells by FOXP3 gene transfer. Sci. Transl. Med. 5: 215ra174.
. 2011. Resistance to regulatory T cell-mediated suppression in rheumatoid arthritis can be bypassed by ectopic foxp3 expression in pathogenic synovial T cells. Proc. Natl. Acad. Sci. USA 108: 16717–16722.
. 2001. Adoptive transfer of cloned melanoma-reactive T lymphocytes for the treatment of patients with metastatic melanoma. J. Immunother. 24: 363–373.
. 2008. Treatment of metastatic melanoma with autologous CD4+ T cells against NY-ESO-1. N. Engl. J. Med. 358: 2698–2703.
. 2009. Adoptive immunotherapy of cancer using CD4(+) T cells. Curr. Opin. Immunol. 21: 200–208.
. 2010. Specific gene transfer to neurons, endothelial cells and hematopoietic progenitors with lentiviral vectors. Nat. Methods 7: 929–935.
. 2004. High-affinity binders selected from designed ankyrin repeat protein libraries. Nat. Biotechnol. 22: 575–582.
. 2013. Cell type specific gene delivery by lentiviral vectors: New options in immunotherapy. OncoImmunology 2: e22566.
. 2013. CD19 and CD20 targeted vectors induce minimal activation of resting B lymphocytes. PLoS One 8: e79047.
. 2008. Targeted cell entry of lentiviral vectors. Mol. Ther. 16: 1427–1436.
. 2011. Lentiviral vectors targeted to MHC II are effective in immunization. Hum. Gene Ther. 22: 1249–1254.
. 2013. Specific gene delivery to liver sinusoidal and artery endothelial cells. Blood 122: 2030–2038.
. 2015. CD133-targeted gene transfer into long-term repopulating hematopoietic stem cells. Mol. Ther. 23: 63–70.
. 2013. The receptor attachment function of measles virus hemagglutinin can be replaced with an autonomous protein that binds Her2/neu while maintaining its fusion-helper function. J. Virol. 87: 6246–6256.
. 2011. DARPins: an efficient targeting domain for lentiviral vectors. Mol. Ther. 19: 686–693.
. 2011. Resting lymphocyte transduction with measles virus glycoprotein pseudotyped lentiviral vectors relies on CD46 and SLAM. Virology 413: 149–152.
. 2014. Mystery solved: VSV-G-LVs do not allow efficient gene transfer into unstimulated T cells, B cells, and HSCs because they lack the LDL receptor. Blood 123: 1422–1424.
. 2009. Efficient and stable transduction of resting B lymphocytes and primary chronic lymphocyte leukemia cells using measles virus gp displaying lentiviral vectors. Blood 114: 3173–3180.
. 2008. Stable transduction of quiescent T cells without induction of cycle progression by a novel lentiviral vector pseudotyped with measles virus glycoproteins. Blood 112: 4843–4852.
. 2011. Measles virus glycoprotein-pseudotyped lentiviral vector-mediated gene transfer into quiescent lymphocytes requires binding to both SLAM and CD46 entry receptors. J. Virol. 85: 5975–5985.
. 2012. T-cell receptor gene transfer exclusively to human CD8(+) cells enhances tumor cell killing. Blood 120: 4334–4342.
. 2008. CD4-specific designed ankyrin repeat proteins are novel potent HIV entry inhibitors with unique characteristics. PLoS Pathog. 4: e1000109.
. 2010. Survival of the fittest: positive selection of CD4+ T cells expressing a membrane-bound fusion inhibitor following HIV-1 infection. PLoS One 5: e12357.
. 2015. Selective inhibition of tumor growth by clonal NK cells expressing an ErbB2/HER2-specific chimeric antigen receptor. Mol. Ther. 23: 330–338.
. 2000. Characterization of novel safe lentiviral vectors derived from simian immunodeficiency virus (SIVmac251) that efficiently transduce mature human dendritic cells. Gene Ther. 7: 1613–1623.
. 2010. In vivo binding and retention of CD4-specific DARPin 57.2 in macaques. PLoS One 5: e12455. 2003. CD3-specific antibody-induced active tolerance: from bench to bedside. Nat. Rev. Immunol. 3: 123–132.
. 2008. Generation of potent and stable human CD4+ T regulatory cells by activation-independent expression of FOXP3. Mol. Ther. 16: 194–202.
. 2011. DARPins and other repeat protein scaffolds: advances in engineering and applications. Curr. Opin. Biotechnol. 22: 849–857.
. 2013. DARPin-targeting of measles virus: unique bispecificity, effective oncolysis, and enhanced safety. Mol. Ther. 21: 849–859.
. 1994. Novel infectious particles generated by expression of the vesicular stomatitis virus glycoprotein from a self-replicating RNA. Cell 79: 497–506.
. 2010. Advances in the field of lentivector-based transduction of T and B lymphocytes for gene therapy. Mol. Ther. 18: 1748–1757.
. 2003. IL-7 surface-engineered lentiviral vectors promote survival and efficient gene transfer in resting primary T lymphocytes. Blood 101: 2167–2174.
. 1989. Internalization and recycling of CD4 transfected into HeLa and NIH3T3 cells. EMBO J. 8: 3641–3649.
. 2012. SAMHD1 restricts HIV-1 infection in resting CD4(+) T cells. Nat. Med. 18: 1682–1687.
. 2014. 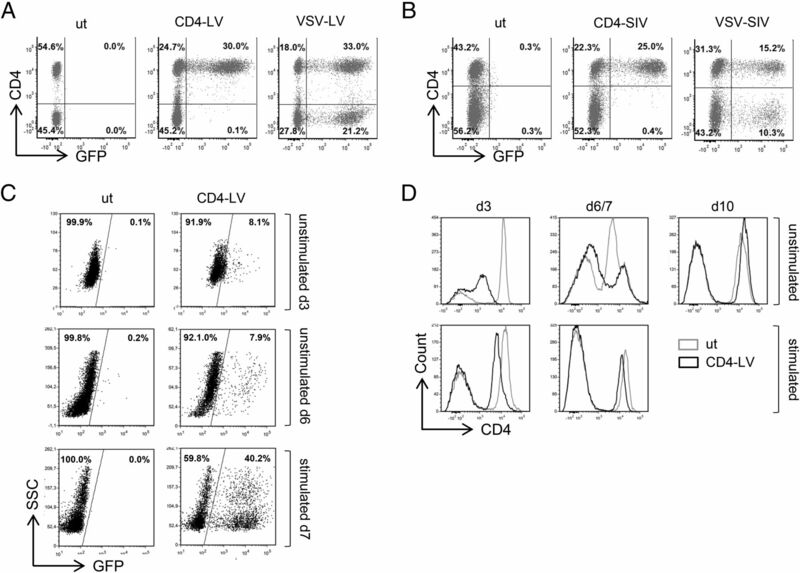 Efficient delivery of lentiviral vectors into resting human CD4 T cells. Gene Ther. 21: 444–449.
. 2003. Specific transgene expression in human and mouse CD4+ cells using lentiviral vectors with regulatory sequences from the CD4 gene. Blood 101: 3416–3423.
. 2009. Targeted transduction via CD4 by a lentiviral vector uses a clathrin-mediated entry pathway. J. Virol. 83: 13026–13031.
. 2009. The CXCR4-tropic human immunodeficiency virus envelope promotes more-efficient gene delivery to resting CD4+ T cells than the vesicular stomatitis virus glycoprotein G envelope. J. Virol. 83: 8153–8162.
. 2006. Selective gene transfer to T lymphocytes using coreceptor-specific [MLV(HIV)] pseudotype vectors in a transgenic mouse model. Virology 351: 237–247.
. 2012. Measles virus glycoprotein-based lentiviral targeting vectors that avoid neutralizing antibodies. PLoS One 7: e46667.
. 2012. Lentiviral vectors displaying modified measles virus gp overcome pre-existing immunity in in vivo-like transduction of human T and B cells. Mol. Ther. 20: 1699–1712.
. 2013. Targeted lentiviral vectors pseudotyped with the Tupaia paramyxovirus glycoproteins. Gene Ther. 20: 16–23.
. 2002. Cutting edge: CD4 and CD8 T cells are intrinsically different in their proliferative responses. J. Immunol. 168: 1528–1532.
. 2005. Cooperation of human tumor-reactive CD4+ and CD8+ T cells after redirection of their specificity by a high-affinity p53A2.1-specific TCR. Immunity 22: 117–129.
. 2001. CD4+ T cells engrafted with a recombinant immunoreceptor efficiently lyse target cells in a MHC antigen- and Fas-independent fashion. J. Immunol. 167: 1090–1096.
. 2006. Human CD4+ T cells lyse target cells via granzyme/perforin upon circumvention of MHC class II restriction by an antibody-like immunoreceptor. J. Immunol. 177: 5668–5675.